"The Case of the Prowling Bear" is on its way! The official release of the book and audiobook will be on May 3rd, but in the meantime, we wanted to give you a sneak peek at the songs. Be sure to let us know what you think of them in the comments below! Hank sings "Be Careful When You Drink From the Pot," and the "Thank You Song" is sung by Wallace the Buzzard (and, just so you know, he's NOT happy about having to sing that song!). 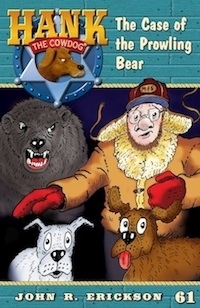 UPDATE: Be sure to get your copy of "The Case of the Prowling Bear" on audiobook!